Medicinal uses: The leaves lower blood pressure and help to improve the function of the circulatory system. The leaves are also mildly diuretic and may be used to treat conditions such as cystitis. There is also some research showing olive leaf’s ability to lower blood sugar levels and therefore being taken by some for diabetes. The oil is nourishing and improves the balance of fats within the blood. Traditionally olive oil has been taken with lemon juice to treat gallstones. The oil has a generally protective action on the digestive tract and is useful for dry skin. 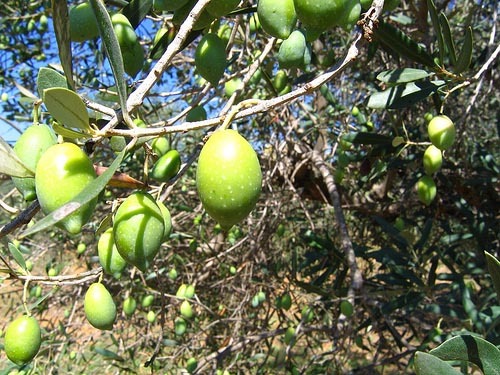 Nutritional information: Olives and their oil are an excellent source of oleic acid, an omega-9 monounsaturated fat. They are also a good source of vitamin E. they also contain flavonoids (Murray 435). Cautions: None known (Chevallier 241).